Celebrating Easter in a delicious way means choosing quality ingredients that have been prepared with care. We suggest a Brunch menu that is simple to prepare and very tasty. The following easy recipes are perfect for entertaining. This recipe can be made a day ahead, if refrigerated, and can be reheated at 300F wrapped in foil for about 30 minutes. It can be served warm or at room temperature. Preheat the oven to 300F. Cut the netting off the ham and rinse the ham under cold water. Cut of and discard the tough outer skin and some of the fat, leaving a ¼ inch-thick-layer. Place the ham in a large roasting pan and make long parallel cuts ¼ inch deep and 1 inch apart all over the fatty side. Repeat the opposite side. Place the ham in the oven uncovered for 1 hour. The make the glaze, combine the marmalade, brown sugar, mustard and honey in a bowl with a fork. Remove the ham from the oven and increase the heat to 350 F. You can stud the ham with the cloves, inserting one at each crosshatch. 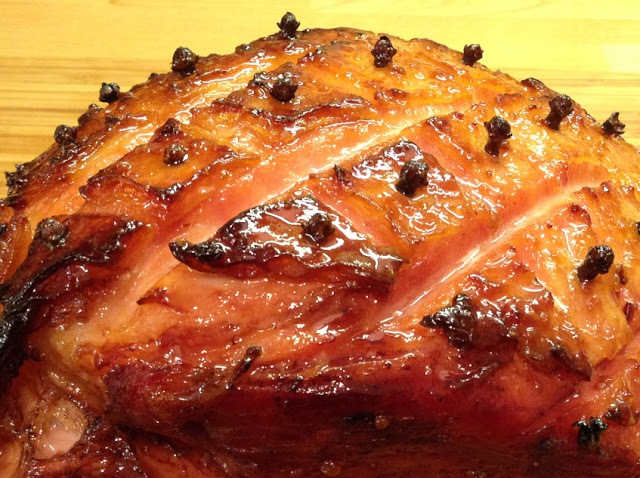 With a wide pastry brush, generously brush the entire ham with about half of the glaze and return it to the oven. Cook for another 45-60 minutes brushing with the glaze every 20 minutes. Let rest covered for at least 30 minutes and serve. This recipe will take about 30 minutes to prepare and to cook. In a skillet over medium heat melt the butter. In a bowl, mix together eggs and cream then pour the mixture in the skillet. Cook the eggs over medium heat stirring with a wooden spoon making sure it does not stick to the bottom of the pan. Once the eggs are cooked, set aside and stir in half of the smoked salmon, keeping the other half aside. Transfer equally in 6 small individual serving bowls and decorate with the salmon set aside, the Maple Syrup Pearls and a sprig of parsley. Serve warm. In a large skillet over high heat, melt 1 tbsp butter with 1 tbsp oil, until bubbly. Add the red and yellow peppers first and sauté until softened and browned, about 3 minutes stirring constantly. Adding equal parts butter and oil as you go, next add the carrots and turnips and sauté for about 5 minutes, until softened. Then add the asparagus and zucchini, cooking for 1 to 2 minutes. Then add the chard. Cook, stirring and tossing constantly, until nice and hot, 5 to 10 minutes. You want all the vegetables to be just tender and heated thoroughly. Sprinkle with salt, toss to distribute, and then transfer right away to a serving dish. Cool at room temperature. Arrange the lemon wedges around the outside of the serving dish. * Recipes provided by Beth Hensperger, The Gourmet Potluck Show-Stopping Recipes for the Buffet Table, Ten Speed Press, Toronto.